I’ve spotted Talon out and about on the blogosphere and Instagram—how could I miss it? It’s constantly being hashtagged under popular book tags. The hardcover is gorgeous, the cover art is eye-catching, and people raved about Kagawa’s writing and ability to tell a unique story. So I decided to pick up a copy. And by pick up a copy, I mean magically beam to my Kindle via Amazon. Kindle = a bibliophilic instant gratification junkie’s dream come true. Talon is a young adult fantasy novel about a teenage girl named Ember who happens to be a dragon. She just is able to blend in as a human, that’s all. Her twin, Dante, is a dragon, too. 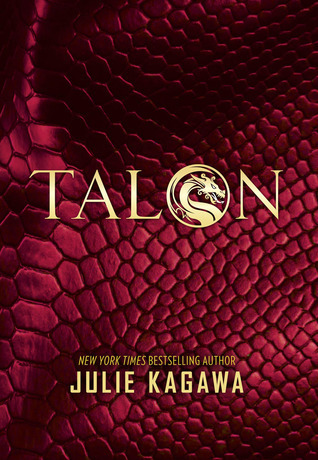 They’re sent to Southern California to continue their dragon training by Talon, a large dragon organization that focuses on keeping the dragon population up and hidden from humans. Enter Garrett, who happens to be a soldier for St. George. Get it? St. George is that knight who slayed dragons to save damsels in distress, forever setting the white horse standard for men everywhere. Saint George slayed a dragon, you can text me back, dude. Garrett is sent to SoCal to try and locate the “sleeper” dragon that Talon has placed. Let the predictable love story ensue. Ember spends most of the book in teenage angst fueled discovery mode, where she uncovers secrets about Talon, herself, and the world around her. The writing was fabulous—I couldn’t put it down because I was enjoying the way Kagawa told the story. The characters were likeable enough, if not a little shallow and flat. The structure of Talon and the dragon world was also fantastic, and it really painted a clear picture for me. I rated Talon 3.5/5. It was an enjoyable read, but it wasn’t anything terribly extraordinary. I would recommend it to people who truly enjoy young adult literature (and teen angst, which I have no patience for) and fantasy.